"Three decadent layers of cotton balls soaked in iodine." On Saturday I was so nervous that I could not stop walking around the house. My body was kinetic. I was mentally prepping myself for something that I was convincing myself I wasn't going to do, so that when I did it, I would have already cleared that mental hurdle, that gulp that's waiting for you to slide down inside, the trapdoor to wallowing and pussing out like a champion. So I cooked, and I let my mind race around, and I made Tiramisu which is the greatest mix of busywork and repetitive movement and soothing smells, steps to indulge in. By the end of it, I was dipping my hair in the leftover espresso, my cheek pressed to the countertop and my fingers tracing lines in the streaked mixing bowls. Just like Nell. That was what I kept my mind on as the afternoon and evening passed. "Tomorrow when it is this dark you will be eating this, you will be done, it will be over, you can do whatever you want." So I went to bed and got up Sunday morning, which had been marked in my head and on my agenda for almost three weeks, with a purpose. My teeth were sharp and fingernails clean, my hair behaved itself and I did what I needed to do and then I got there and realized that I was 24 hours and 15 minutes late, instead of 15 minutes early. My phone was dead and I was too distracted to check it yesterday, even after it charged, so I missed the voicemails and questions and I felt like an idiot. I e-mailed, begging for mercy in restrained tones and I haven't heard back. There is nothing to do but feel like a dope. And then go thrift shopping, and come home to good news on other fronts and laugh about it but not really, then eat that promised tiramisu, ingest the bribe. This morning when I woke up I felt a little worse than yesterday, a little shaken and so I ate a little more. Whatever it takes. 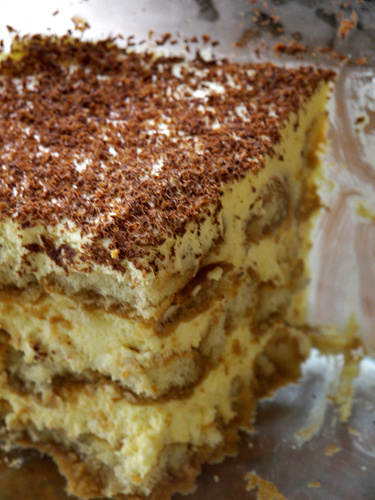 This is not a traditional Tiramisu, but I am not up for trying to defend it beyond saying that it is delicious, that Mascarpone cheese is expensive and I don't mind forgoing it, opting for available-everywhere cream cheese. And when you fold in the whipped cream it kind of recreates the texture you're aiming for, cutting the rich, savory edge that cream cheese has. My only sticking point is to plead that you use the best quality of each ingredient for a dessert like this -- I used free-range, veg-fed eggs and whipping cream with no stabilizers or added ingredients. Use a cream cheese that you enjoy the taste of, and the same goes for your coffee/espresso of choice. The chocolate is a garnish, but provides a definite bite. I used a Green & Black's Espresso bar. You could use Pine Bark. 4 large egg yolks, room temp. Chill the bowl and whisk/beaters of your stand mixer, or a large glass bowl if you're going to prove to go Ma Ingalls on us and do it by hand, or with an electric mixer. I stash mine in my freezer for at least fifteen minutes, or as long as it takes for me to forget about it and then when I find it, an hour later, I feel like some kind of champion. Brain champion. Pour the cream into the chilled bowl and whip until medium-stiff peaks form. Set aside, transfer into another bowl even. In the same bowl you whipped the cream in, beat the eggs and 1/3 cup of sugar until light, thick and pale, pale yellow -- do not stop until they resemble a thick hollandaise or lemony nacho cheese sauce. You want to "cook" the yolks with the sugar and inflate them with air. Otherwise, you'll be a little grossed out. Add the cream cheese, the other 1/3 cup of sugar (you can use less, depending on your personal tastes), vanilla and almond extracts to the egg yolks and beat until completely combined. Now, with a spatula, gently fold in the whipped cream in an over-under fashion, making sure to rotate the bowl and swab down the sides until very few, if any, light streaks of cream remain visible. Set aside. Swirl or whisk together the coffee, liqueur and vanilla in a shallow bowl or what I use, Pyrex pie plate. With your chosen serving dish (depending on the size, depth and length, you'll have enough of the cream mixture for two to three layers) at the ready, gently dip both sides of each ladyfinger in the solution, then arrange with brisk, no-nonsense force in a single layer over the bottom of the dish, breaking some in half or thirds to fit any gaps. It doesn't have to be perfect, but if you like, you can do a practice run with the dry biscuits. Top with 1/3 or 1/2 of the cream cheese mixture, and spread to cover and fill in any gaps. Now repeat 1-2 more times: Dip the ladyfingers, arrange, cover and spread. Once you reach your final layer of creamy goodness, shave or grate bittersweet chocolate all over the top, cover tightly with plastic wrap and chill overnight. Eat with shame, tonight and tomorrow. The tiramisu looks wonderful- I sympathize mascarpone can be pricey, a good substitution is half cream cheese half sour cream. My recipe is virtually the same, except I use either rum or marsala for the liquor, depending on what I haven't already drunk up. The Starbucks sounds great though, you know, if I was able to buy it in this dinky, one-grocery store town. But I'm confused. You spring for 'free-range, veg-fed eggs and whipping cream with no stabilizers' and then cave to regular cream cheese instead of mascarpone? I beg you to reconsider. The mascarpone takes it to a H...N...L.
And this dessert is worthy of only the best. I've done the same thing, showing up a day late. A year ago. It still isn't funny, but maybe it will be someday.